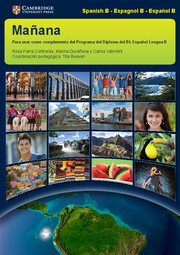 Tailored to the 2013 IB Language B syllabus, our full-colour coursebook, Mañana, contains everything you need to succeed in your two-year Spanish B course. This teacher's book accompanies the Mañana coursebook and is specifically designed to support teachers in preparing their students for the Spanish B course for the International Baccalureate programme. The book contains answers to all the question in the coursebook, pedagogical aims of each exercise, advice on specific tasks aimed at Higher Level students and additional activities that complement the exercises in the coursebook.